Here’s a pretty picture: For several years, there wasn’t a single drugstore foundation that didn’t make an absolute MESS of my face. I know you’re thinking stop being so dramatic – but it’s the truth. For whatever reason, every single drugstore foundation I dropped money on would go from pretty good to a complete disaster in just a few short hours. I know you know the feeling. When a cheap drugstore foundation gets heavier and heavier, literally suffocating your pores. Add to that bizarre breakdown issues that resulted in either dry patches or oil spills depending on the formula and it wasn’t pretty. Even Revlon’s cult favorite Colorstay foundation (that everyone swore UP and down would work for me) would literally make me want to claw my face off. 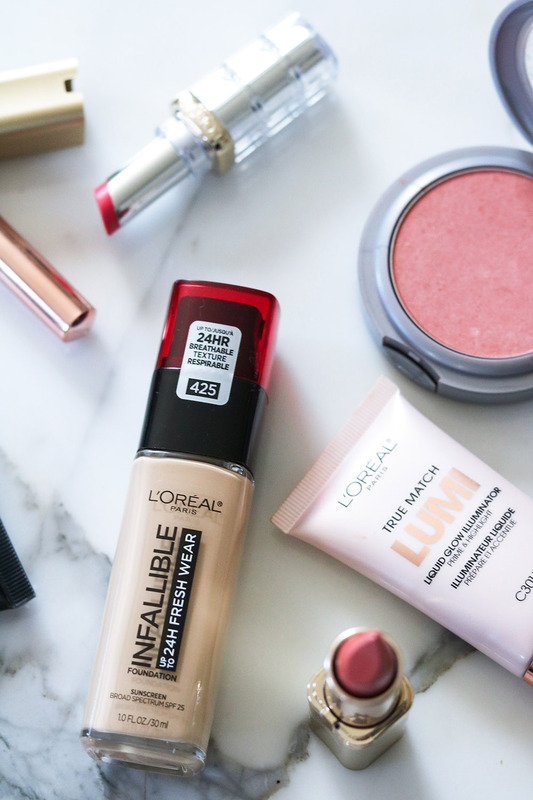 Then, Loreal dropped their landmark Infallible 24-Hour Pro-Matte Foundation in 2015 and everything changed. It was the first drugstore foundation that actually held up through the day on my skin – both in appearance and feel. LONG-lasting — with absolutely NO touch ups. Does not exaggerate fine lines and pores! No patchiness, grease spills or a combination of both. 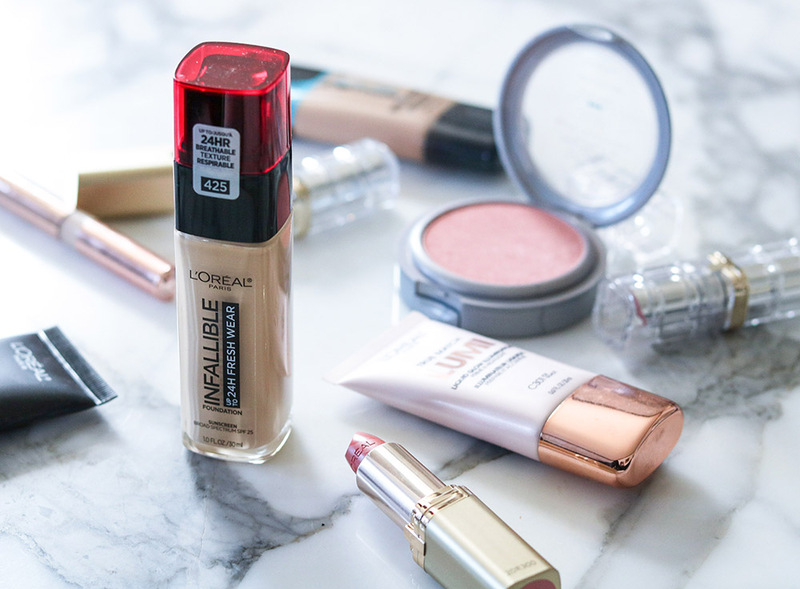 Now more than four years later, L’Oreal’s Infallible foundation is one of only two drugstore foundations I will use – with the Wet n Wild Photofocus Foundation as the second. As a big Pro-Matte fan, obviously word of Loreal introducing a new foundation to the Infallible range perked my ears up. I mean, I obviously had to figure out just how well it measured up to one of only two drugstore foundations I approve of. I was determined to know! So determined, in fact, that I drove to several Target, Walgreens and CVS locations on a mad hunt to find it…with no luck. 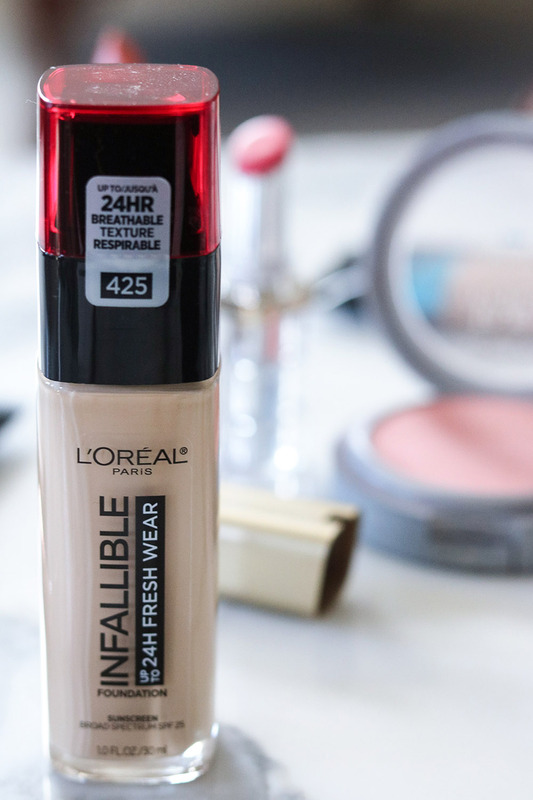 First off – let’s REJOICE that the Loreal Infallible Fresh Wear Foundation has *drumroll please* a PUMP! Great packaging aside, we all know it’s what’s INSIDE the bottle that actually counts. How Well Does the Fresh Wear Foundation Measure Up? Obviously a long list of things come into play when determining how great a foundation actually is. That said, I go into pretty comprehensive detail below! As always, it’s my goal to give the most thorough review as possible and answer any lingering questions you may have before making a purchase. If there’s anything at all that comes to mind for you that I don’t touch on: PLEASE ASK! Seriously, I’m an open book. If you have a question put it in the comments and I’ll answer as quickly as I can. That said, let’s get into all the nitty gritty details of the new Loreal Infallible Fresh Wear Foundation! Upon first use, I was really surprised at how lightweight and thin the Fresh Wear foundation’s formula is. It’s pretty surprising in fact and made me think the coverage would be minimal…but that’s not the case at all. By design, I’d say this is the lightest “long-wear” foundation I have ever come across. Hands down. When looking over reviews, I noticed several of people disappointed that this isn’t a full-coverage foundation. It kind of confuses me why they took this to be full-coverage in the first place as Loreal doesn’t claim that anywhere…but I wanted to be sure to make clear it’s NOT full coverage here. 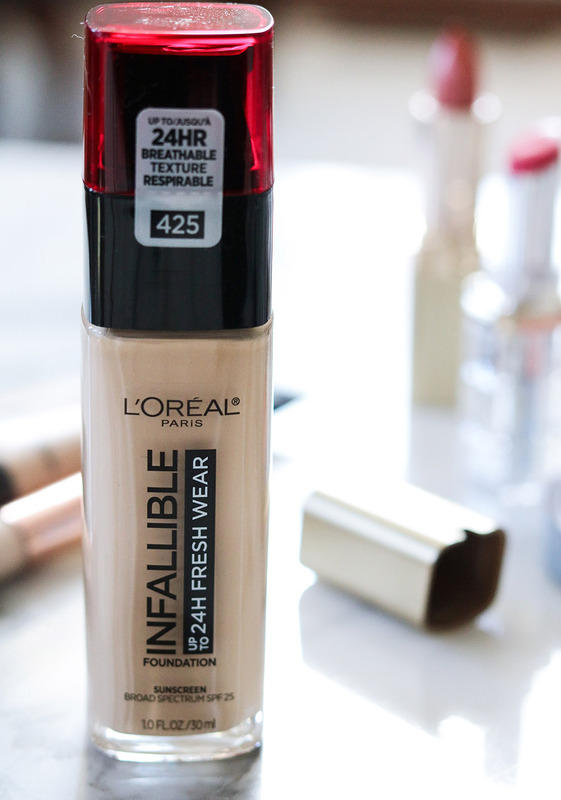 Instead, the Loreal Infallible Fresh Wear foundation has medium coverage…leaning a step towards light. Given the ultra light-weight formula, it can easily be layered for boosted coverage if you like. When I say this is a matte foundation, I’m sure you wonder how smoothly it applies. After all, it is matte foundations that tend to be heavy and cake-like on the skin. Ultimately, because of the super super duper light-weight consistency…this applies beautifully. In fact, it applies as smoothly as a BB cream! Yes, as promised the Loreal Infallible Fresh Wear foundation is in fact long-lasting. Obviously it would be pretty bonkers to wear this for 24+ hours so I didn’t go that far…but it lasts a full work day and through the evening. While the other Infallible foundations are great, they do have more limited shade ranges. Loreal really went BIG for the Fresh Wear foundation, delivering the new formula in thirty shades! That’s pretty impressive for a foundation coming right out the gate. 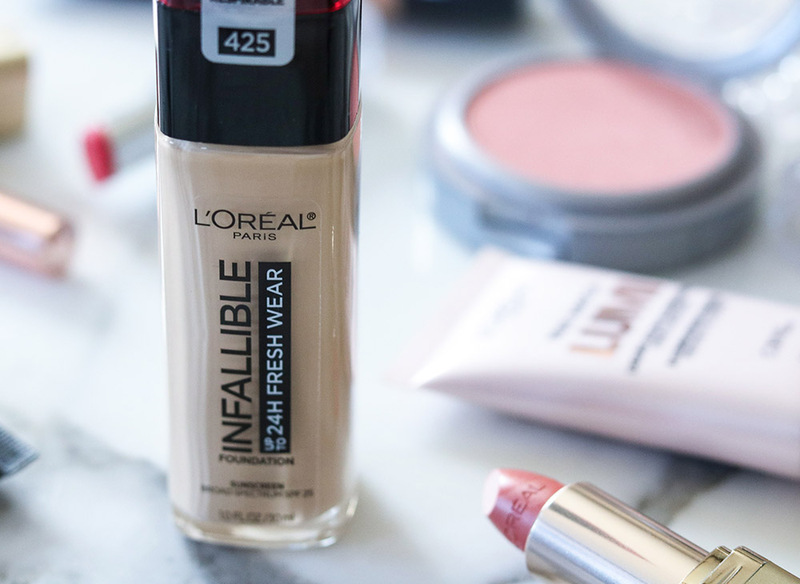 When first trying out the Loreal Infallible Fresh Wear foundation, I was taken by surprise by how light-weight it truly is. That’s not something you usually find in long-wearing foundations and definitely sparked my interest. To see how my skin reacted to it, I wore the foundation consistently for a week before sharing my thoughts with you today and find that I really quite like it. I’m not head over heals in love…but it’s a good foundation and one I do recommend. Through the work week and trips to the gym, the Fresh Wear foundation did a pretty solid job at maintaining a nice appearance while also not growing increasingly heavier through the day. And I really love that while it is a “matte” foundation in my eyes, it has a radiant appearance that I find really pretty. I’ve been struggling a lot with my insomnia for some reason lately, so that is another big help in the morning! Here’s the Loreal Infallible Fresh Wear foundation on my skin – with no primer and two seriously tired eyes, lol. Naturally, there are always pros and cons to every product. With that in mind – and how long I feel like this post is – I’m going to step into more “bullet-point” style now to rundown all the final details for you below. Available at local drugstores, supermarkets and Loreal’s website. Excellent color selection. 30 shades, people. THIRTY!!! Extremely light-weight consistency. Surprisingly light-weight. Does a remarkable job fighting off oil through the day. No greasy nose for you!! Settle into pores (without a primer). Not horribly, but not as blurring a formula as I would like. The pump-style packaging leads to a price jump over the sister Infallible foundations. 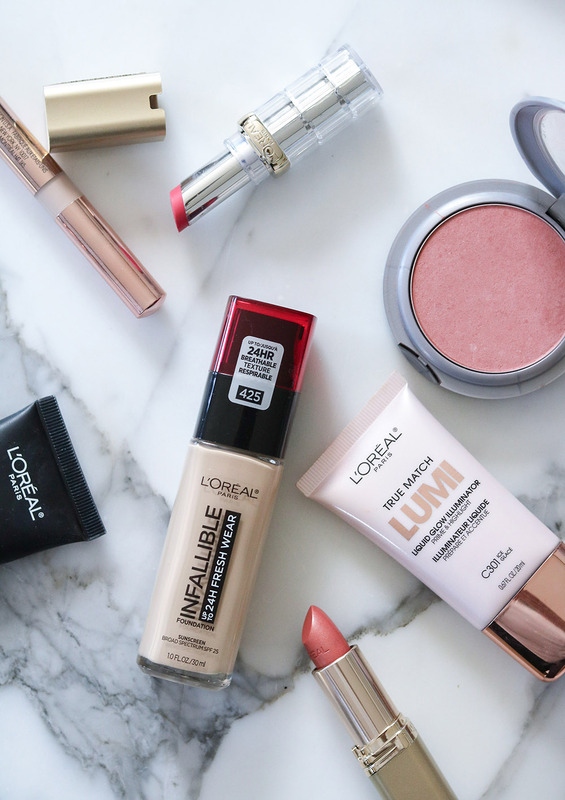 At $14.99, it’s now Loreal’s most expensive foundation available. Overall, I have to say I quite like this foundation. It definitely catches my own eye when casually looking in the mirror, giving a soft radiant look to the skin without venturing into the “glow” region. It has a natural finish that wakes up the complexion and is quite pretty. That said, I do kind of cringe a bit when looking closely at my pores. It’s not horrible by any means, but I was honestly hoping the Dimethicone would do more to smooth over the craters in my face. Granted, I’m hard on myself and it’s pretty rare for someone to be looking at my pores as discerningly as I do my own…but it’s worth saying nonetheless. That said, a primer DOES help minimize the appearance of pores. I like this one from Boscia and ELF has several great ones at the drugstore. Bottom line? I pretty much consider this foundation to be the beloved baby sister of Loreal’s Pro-Matte foundation. The two have a very similar finishes – except with the Fresh Wear formula you’re getting a much more light-weight product. 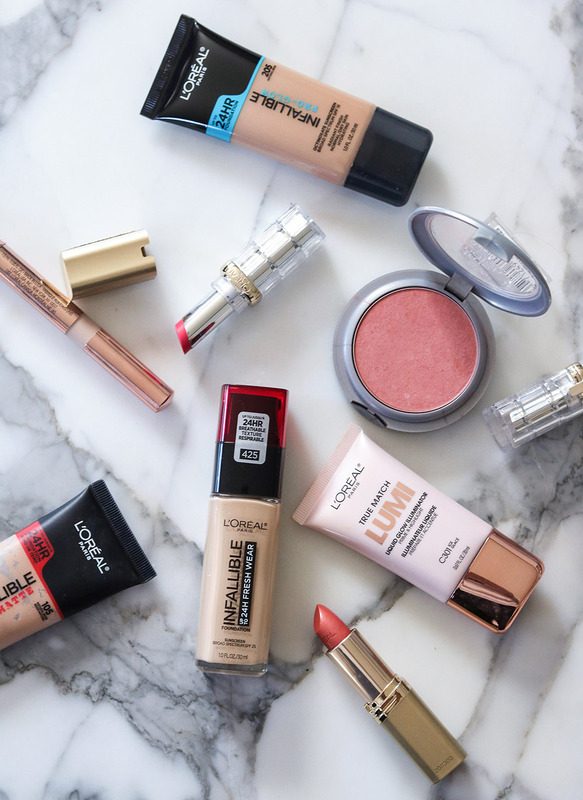 Coverage is understandably less, but the two foundations share pretty equal wear times and are both incredibly easy to apply. If you’re a fan of the Pro-Matte foundation, I think you’ll like this a lot. If you like the Pro-Matte formula but find it a bit heavy, you will LOVE this. The Fresh Wear foundation has also managed to increase my list of “Approved Drugstore Foundations” from two to three. Between this, Pro-Matte and Wet n Wild’s Photo Focus it is an admittedly short list…but what can I say? I’m PICKY! Thanks so much for reading! I bought this foundation on my own and all thoughts/opinions are 100% my own. If you’ve tried the Fresh Wear foundation about for yourself, I’d love to hear what your experience with it has been like!